The other day, I set out for one of the most significant Balinese ceremonies that I’ve ever been honored to witness; akambuan, markin g 42 days since a baby’s birth, and ending the period during which the mother and newborn are considered impure. But even more than the importance of such a ceremony in the life cycle of a Hindu Balinese, this was one 42-day baby debut that I was not going to miss. It was a long time coming. Such a very, very long time. Some might say, overdue. I met Wayan not long after arriving in Ubud, perhaps within the first six months of my arrival, more than six years ago. She proved to be extraordinarily gifted, comforting my aching body with masterfully deep – but also soothing – massages. But I was also taken with her personality; she was warm, charming, and we laughed easily – at my amateurish attempts at Indonesian, no less than her English mistakes. I felt blessed to have been led to Wayan’s capable and loving hands. Then, I met her husband, Komang. He was equally easygoing, an d as she was beautiful, so was he handsome. More importantly, from the first day that the three of us sat together, I could tell that their connection, mutual respect and adoration was unmistakable. That love had, eight years ago borne a son, Arya. 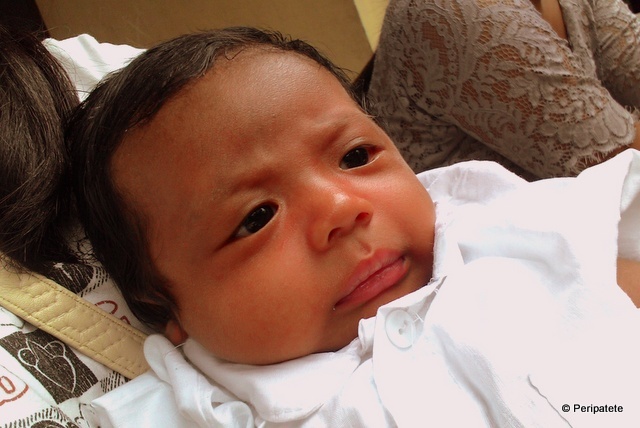 According to Balinese custom, a son is a critical addition to any family; in fact, Komang’s own parents conceived six girls before he came into their lives. With Ary a’s birth, Komang and Wayan could, at least according to tradition, rest assured that their firstborn would care for them while they aged, and provide for their cremation and subsequent ceremonies upon their eventual death. Then they were ready for another child. But they met many challenges along the way – including a full-term baby boy, born six years ago, who died in hospital shortly after birth. The baby, their second-born, was named Kadek. They followed custom in burying his sacred ari-ari (placenta) in their compound, in the ground, close to where Arya’s was interred. It would serve as a memorial to their son, as much as to their loss and grief. And then, with bated breath, Wayan gave birth. Again. Almost six weeks ago. To Komang – the traditional na me given to the third-born child. Now, 42 days later, it was time to celebrate. This was one ceremony that I was not going to miss. From near and far, the relatives came. The local mangku (priest) and his wife came too. There were plenty of offerings. The priest rang his bell. His wife led Komang, Wayan, Arya and baby Komang through the motions; with prayers, wrapped coconuts, long green blades tied to – and ri ce grains pasted on – their foreheads, given sips of holy water. The bamboo stalks popped from a fire lit underneath – competing with sounds from the television nearby. Two baby chicks, wrapped up in sacred cloth, played their role – as did the sacrificial animal, a rust-colored suckling pig blessed in the central pavilion. White strings were wrapped around wrists. Eggs and leaves were touched to chest and palms, swept across their feet and shaken in the air. The rituals were marked by some confusion, laughter and Arya’s juvenile antics. Naturally, there was food to mark the milestone: Roast suckling pig and rice, chicken, cooked jackfruit and watermelon. To quench my thirst, a cool glass of coconut water with a twist of lime. When Komang Junior temporarily came up for air, from his near-constant need for susu ibu (mother’s milk), Wayan had a short break. With her sister-in-law, she walked down to the river for a cleansing ritual that marked a pivotal time of her own; she was now free to leave the house without risking the possibility of bringing evil spirits to those she visits. The air crackled with an abundance of joy – and, no doubt, relief. Long after most of the relatives left, after dusk settled down around us (when Arya, for a short while, left for a birthday party, returning with a Hello Kitty paper crown on his head), after Wayan’s parents headed home on their motorbike, after the offerings were disassembled, after bapak Komang had swept away all the detritus, after the mangku bade us goodbye, and after Komang Junior, the miracle baby, suckled for maybe the hundredth time that day, it was, finally, time to go. Great photos and lovely description of this precious ceremony. Being a fortunate recipient of Wayan’s healing hands, I so appreciated this piece and only wish I’d been there in person. We stay in touch via email, however. I’m so happy they’ve been blessed! Thanks for this, Amit ! Great description of a beautiful ceremony ! So happy to see Bali presented this way : the old traditions still survive all around us, in spite of modernization clawing its way around and leaving a ruined track… Thanks : it’s ceremonies and traditions like this that make it attractive for me to stay here in Bali…, as well as the great people ! Indeed it was.. but mostly incredible because of Wayan and Komang themselves. Salt of the earth! Oh my gosh this is just so heartwarming a story. So beautiful. The photos are so tender and lovely. Balinese ceremonies are something to behold… Interesting that the mother and baby have to wait that amount of time to do the ceremony and become pure again. How wonderful for you to be a part of that and for it to have so much personal meaning and relevance due to your close connection with both of the parents. Just lovely Amit! Thanks Peta. I felt so grateful and honored to have been asked to join this profoundly moving rite of passage.